Up first are the latest lies from Vice President Pence regarding the Caravana Migrante which are based on here say and from the lips of the most sickening and corrupt President of Honduras Juan Orlando Hernandez. Where is the evidence ? Within the report are the lies from Trump regarding MS-13 & Middle Eastern Terrorists within the migrating group. After the report are links to Aristegui which highlights the march. We were not here yesterday, actually we were at Immigration in TIJ. The US vice president said that the only solution is "a Congress willing to finance the wall, to secure our borders and also close the gaps used by traffickers and criminal gang members ... to encourage people to make the long and dangerous journey" . 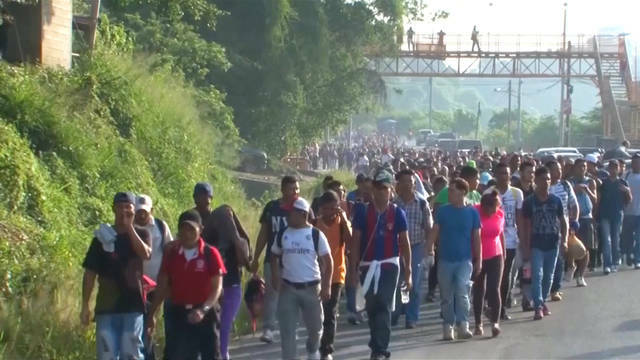 The migrant caravan is being promoted by leftist Honduran groups financed by Venezuela to challenge the sovereignty and the US border, said US Vice President Mike Pence on Tuesday. Pence stressed that the Donald Trump administration is working closely with Mexico to resolve what it called a "crisis." "We will do everything possible to prevent this caravan from coming north and violate our border," said the vice president. However, he maintained that "in the last analysis it is an issue in our elections because what people traffickers are doing, what members of criminal gangs are doing ... is to take advantage not only of our porous border , but of gaps in our laws ". Pence said that the only solution is "with a Congress that is willing to finance the wall , to secure our borders and also close the gaps used by people traffickers and criminal gang members ... to encourage people to make the long and dangerous journey "
The United States holds elections on November 6 to renew the 435 seats in the House of Representatives and 35 seats in the Senate. Surveys show that Democrats enjoy an advantage over Republicans to regain control of the House. "We have a crisis in our southern border and the only way we can deal with that crisis in the long term is by making changes in the laws," he said. On Trump's statements in which he affirms that people from the Middle East infiltrated the caravan from Honduras to the United States, Pence said that the "statistics" show such a thing. "It is inconceivable that there are no people of Middle Eastern descent," said the US vice president. He also noted that voters have a "clear choice" during the election: "Democrats support arrest and release, have opposed the wall , have opposed more efforts to comply with domestic law ... The Republican Party is committed to building the mur or, committed to close the gaps, to end the detention of liberation and reform a broken system of migration, "he said. "...Demonstrators were out on the streets to protest against the presidency of Juan Orlando Hernandez (JOH), whom they and several organizations accuse of stealing last November’s presidential elections from Salvador Nasralla of the Opposition Alliance coalition. Protesters say the Hernandez administration and other government officials committed fraud in order for the incumbent to take last year's presidential election. 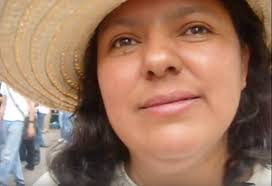 Between late November 2017 and January of this year, over 30 anti-JOH protesters were killed, which Honduran human rights organization, Cofadeh, said were killed at the hands of state security forces. Protests against the current president, who has U.S., Mexico, and Canadian support, have been sporadic since January for fear of military and police retaliation. Hernandez and his political party - National Party - are also allegedly connected to several government corruption scandals. At Saturday’s protests, journalists from canal UNE-TV were also attacked." Democracy Now ! Covers the Caravana Migrante with interviews of Oscar Chacon and Ana Gamboa. Oscar Chacon hits the nail on the head by stating that there is no strong counter narrative from the Democrats regarding Caravana Migrante - but we are not surprised - it was Hillary who sanctioned the 2009 Coup. And I might add, do not expect to see an honest and strong counter narrative from the Democrats anytime soon Oscar. 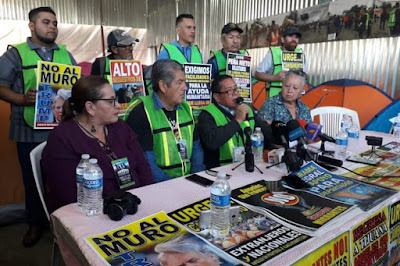 Central American migrants who are in transit could reach Baja California in an approximate time of 20 to 25 days, according to José María Lara, coordinator of the Juventud 2000 shelter in Tijuana. The shelters, added Lara, are currently facing an occupation of 70% of their capacity, given that they continue to receive migrant connats and small groups of foreigners, but without resources. For this reason, Youth Hostel 2000 was the stage for the Migrant Alliance, which brings together various associations that help migrants, to issue a manifesto dedicated to the authorities, requesting their support in the face of the arrival of more displaced people from their places of origin. . The manifesto in general requests that they be guaranteed respect for their human rights to Central American migrants, as well as actions that prevent them from being criminalized in their transit through the country. "The people of Central America are fleeing from violence and poverty. He only comes looking for the shelter of the United States, to be able to start a dignified life that they can not have in their countries of origin, "said Lara. The migrant caravan left Honduras a few weeks ago with the goal of reaching the northern border between Mexico and the United States to apply for humanitarian asylum to the government of Donald Trump, on their way to our country they were added to become a group of more than 6 thousand Honduran, Salvadoran and Guatemalan migrants.